Gokatana 5.5″ & Kanagawa 30t Hair Scissors Double Swivel Rose Gold R Titanium Set. 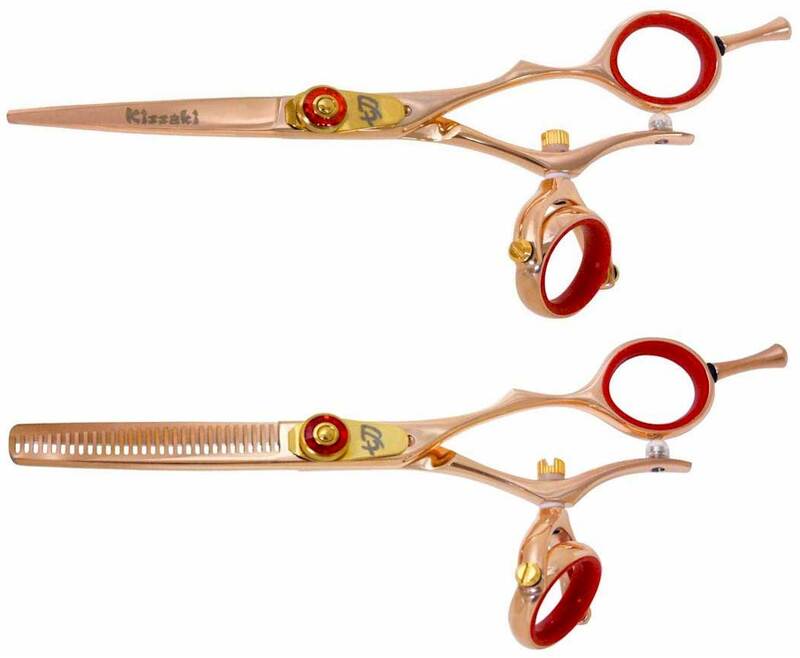 This is a Kissaki matching set of Double Swivel Shears including the Gokatana 5.5″ Rose Gold R Titanium Hair Cutting Shears & the Kanagawa 5.5″ 30 tooth Rose Gold R Titanium Hair Thinning Shears with a red easy click tension adjustment knob. The thumb swivels full range of 360 degree motion, great for reducing and preventing Carpal Tunnel Syndrome and painful cutters cramp. Featuring the Kissaki ultra sharp Convex edge, triple hand honed and hollow ground for durability and Razor sharpness. These Double Swivel Hairdressing Scissors are made from the Highest Quality Japanese Hitachi SUS 440C Stainless Steel (Rockwell Hardness of 60+) and coated with beautiful Black Titanium for extended durability. 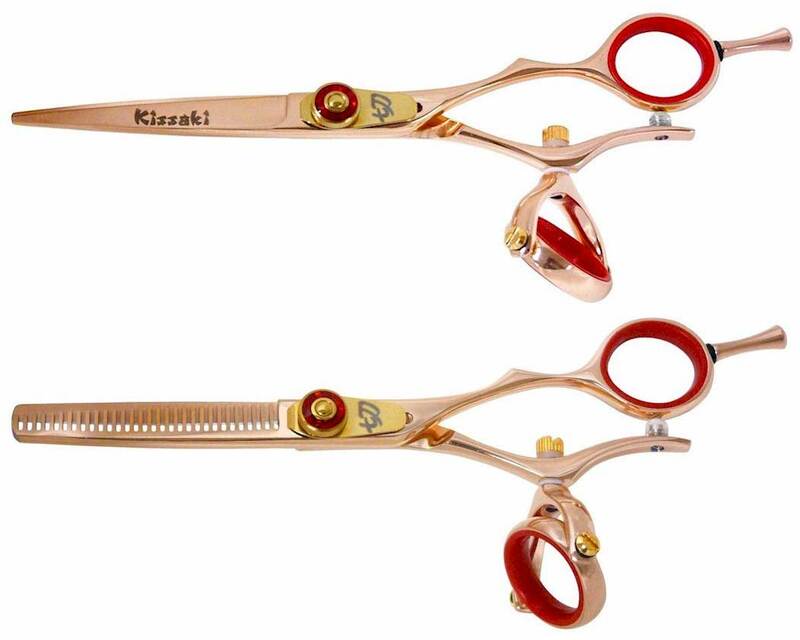 This Gokatana 5.5″ & Kanagawa 30t Hair Scissors Double Swivel Rose Gold R Titanium Set is an ideal matching set of Hair Shears for professional Hairstylists, Hairdressers and Barbers in high volume hair cutting salons. 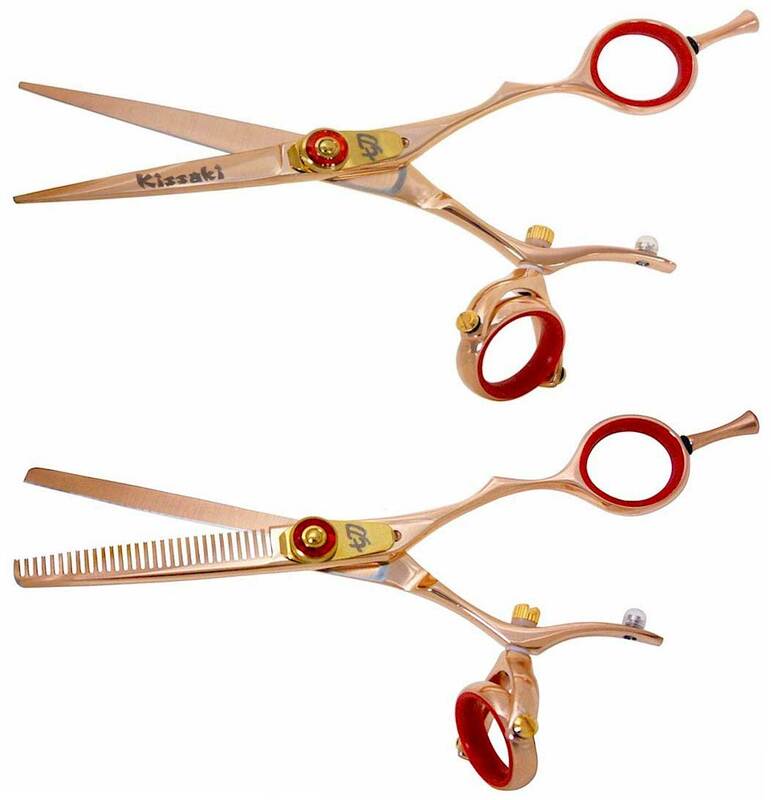 All Kissaki Hair Shears are Lifetime Guaranteed and come with our beautiful custom shear case including lubricant, finger sizing rings and a leather cleaning – polishing cloth.